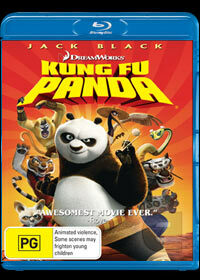 In Kung Fu Panda, Jack Black breathes life into Po, a noodle-hustling, chop saki flick dreaming giant panda bear. Po’s father, Mr. Ping (played by the great James Hong), but has cemented a future for Po selling noodles for a living but the Eastern baloo has a bigger destiny. However for Po, he dreams of a life of martial arts and when he hears about the Dragon Warrior being chosen, he ditches his noodle stand and makes his way to the coronation ceremony. For grand Master Oogway, an ancient tortoise (Randall Duk Kim) believes it best to appoint the next Dragon Warrior after having a vision that the dangerous Tai Lung, a rebellious former student of his and Master Shifu’s will break out of his prison and destroy the village. When Po crashes the ceremony he finds Oogway’s finger pointed at him. Po’s stature, weight, and nature as a hungry and rotund bear who doesn’t know a thing about being a true warrior makes him the unlikeliest of heroes, but a prophecy is a prophecy and Oogway makes it certain that a mistake was not made. The movie is an exciting epic, animated fights that look and feel amplified in high definition grounded by a fast-paced story full of intense moments the deserve a cheer or two by the end. Most importantly you’ll have fun with Po who in his own way embraces the culture instead of mocking it. This is Dreamworks Animation’s best looking film by far! In 2.35:1 ratio and 1080p, Po’s hair is amazing in all of his awesomeness, details in the backgrounds are clear, and this is one of the most refreshing and vivid color palettes that I’ve seen in some time. For sound, the action sequences especially create a whirlwind environment of spatial effects with plenty of resounding punches and kicks thanks to the English 5.1 Dolby True-HD track. In conclusion, Dreamworks put together a lush and beautiful feature with all the bells and whistles of high definition to make this a truly wonderful experience. The story is great for children of ALL ages and once you've watched the movie, why not sit back and enjoy the special features.